(We sell a wide range of singlespeed and track chains at VeloSolo, all suitable for on or off-road use. All are designed to be less flexible laterally with tighter tolerances than typical geared chains and therfore offering improved performance for 'non-geared' drivetrains). If you need a basic chain tool please see the Cyclo tool further down which is suitable for any of our chains (more chain tools in the tool section too). A superb option in 3/32" high spec chains and perfect for singlespeed use on or off-road. The KMC Z610HX has heat treated 'Bull's-Eye' riveting pins, stretch-resistant links and other features giving exceptional tensile strength of 1300 kg. Manufactured with specially shaped links. Suitable for 3/32" drivetrains. Use with road or mountain bikes equipped with 3/32" chainrings and cogs. All nickel silver finish with 112 links. Includes joining link. 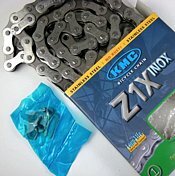 A superb 1/8" high spec chain from KMC. Unique amongst all the other chains we offer, this one is made of stainless steel. The KMC Z1X is heat-treated for extra strength and being stainless steel is completely rust proof (you still need to lube it though!). Suitable for 1/8" drivetrains. Use with road or mountain bikes equipped with 1/8" chainrings and cogs. All stainless silver finish with 112 links. Includes joining link. 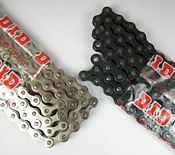 Hugely popular singlespeed specific chain suitable for 1/8" drivetrains. Use with road or mountain bikes equipped with 1/8" chainrings and cogs. All nickel silver finish with 112 links. Bushingless construction for smoother quieter operation. Includes joining link. Same model as above but this one in an attractive all gold finish. 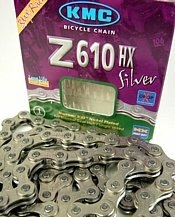 Use with road or mountain bikes equipped with 1/8" chainrings and cogs. All gold finish with 112 links. Bushingless construction for smoother quieter operation. Includes joining link. High quality 1/8" singlespeed specific chain from KMC made up entirely of 1/2 links giving a unique look. 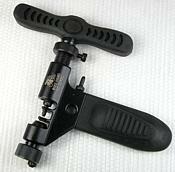 Fully adjustable and heavy duty. Marketed for BMX but suitable for fixed and singlespeed abusers of equipment too. Very useful for 'magic-gear' (see FAQ) set-ups on a singlespeed or fixed mountain or road bike. All silver finish with length of 128cm. For singlespeed 1/8" drivetrains only. Complete with special joining pin. Please check your current chain length if unsure of suitability. Part of the Miche track groupset. 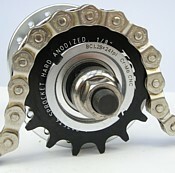 Singlespeed chain suitable for 1/8" drivetrains. For road or mountain bikes equipped with 1/8" chainrings and cogs. All silver finish with 100 links. Excellent value chain from the 'smaller' Italian component maker. Includes joining link. A new model offering DID quality at a lower price than the Pro with a choice of black or silver finish. High quality reliable chains made in Japan. All nickel silver finish or all black finish, both with 110 links. Includes traditional spring type master link. Beautiful top level chain from DID. Track specific and NJS certified and stamped for professional Keirin track use with screw type master link (included) and hardened pins. All silver finish with 106 links. Super strong, top spec. If you have a chain without a specific joining link or do not want to use a chain tool every time you want to remove the chain then this is a good old fashioned split link. Use to join one male end of a chain to the other male end. Install with the closed end facing direction of travel, remove with a small screwdriver by prising open the split end. Sale is for pack of two for 1/8" chains only. These are the newest type of joining link as included with many KMC chains. Very convenient to use as the chain can be split or joined without the use of any tools. 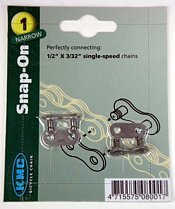 Please see this link for instructions on how to fit the 'snap-on' style link. Sale is for pack of two in 1/8" ('bagged') or 3/32" (carded) width. At last we have a replacement half-link for the discontinued KMC models. Very handy little half-link in an attractive nickel finish, both ends male allowing the chain to be shortened by half the normal amount. Instead of removing a pair of links use this to connect one female link to another female link. A normal pair of links removes one inch from your total chain length, a half-link removes 1/2 an inch and allows the wheel to move back or forth by just 1/4 inch. Ideal for fine tuning chain length for precise positioning of the rear wheel or for 'magic gear' set-ups etc. See FAQ for half-link advice. This is 1/8" thickness and male to male specific. KMC 1/8" Male to Female Half Link - back in stock again! We have not seen any for three years or more but at last we have another supply! Male to female type. Use this to connect one male link to one female link. 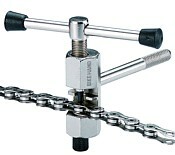 Ideal for fine tuning chain length for precise positioning of the rear wheel or for 'magic gear' set-ups etc. Please see FAQ for half-link advice. This is 1/8" thickness and male to female specific. Superb high spec all metal BB and a great alternative to the Tange. Size 103mm only. Sealed cartridge type with reliable and tough steel cups and square taper steel axle. See FAQ for advice on the different BB tapers. Suitable for English threaded 68mm BB shell. Intall with a Shimano pattern splined BB tool (tool section 26BB-2A). Very similar to the model above, this one has aluminium alloy cups. Length is 110mm (107mm discontinued). Sealed cartridge all metal shell and cups. Square taper steel axle. See FAQ for advice on the different BB tapers. Very similar to above but branded Tange. Sealed cartridge with metal cups and excellent bearings. Highly recommended. Now in stock in all lengths (103/107/110/113/115/118/122/127) to fit any JIS chainset. See FAQ for advice on the different BB tapers. Note: the 110mm measures 110.5mm (as it has always done) but Tange have started marking the boxes '111mm', the size remains the same at 110.5mm. 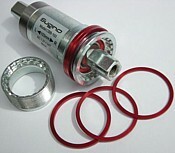 Sugino Sealed Bottom Bracket - back in stock! Sugino's sealed cartridge BB, all metal cups with excellent bearings. Length is 103mm with JIS taper. Correct size for Sugino RD chainset. Also suitable for other JIS chainsets requiring this length BB. See FAQ for advice on the different BB tapers. Suitable for English threaded 68mm BB shell. 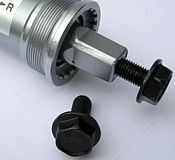 Intall with a Shimano pattern splined BB tool (tool section 26BB-2A). 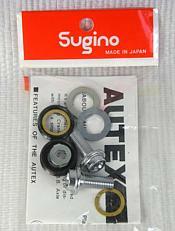 Note: Sugino have updated these and they now come with black and grey finish to the cups/body/spindle. A superb quality road BB and packed full of features at this price. Carbon fibre shell, hollow machined cro-mo steel axle and cold forged aluminium alloy cups. Complete with 'high rolling' sealed bearings. Mounting bolts included. Highly recommended. Available in ISO taper (suitable for Campagnolo and other Italian chainsets) or JIS taper (suitable for most Japanese chainsets). All designed for English threaded 68mm shell road frames. Weight approximately 205g to 225g. Lengths available; ISO available in 102mm and 111mm. JIS available in 103mm (113.5mm JIS discontinued). See FAQ for advice on the different BB tapers. Replacement model for the older YST model stocked previously. These are a brilliant 'get out of trouble' product if you have a frame with damaged or stripped bottom bracket threads. Instead of the usual threading, the cups have tapering sides to fit snugly into the BB shell. One side of the BB threads onto the other side pulling the two halves together within the frame. Use with Shimano, Hope, Raceface, Sugino, Miche, Campagnolo etc 'Hollowtech', splined or square taper bottom brackets, MTB or road (English - NOT Italian). Ideal to replace lost spacers, provide additional spacers to fine tune chainline or as an upgrade to the plastic spacers supplied with most 'Hollowtech' BB's. CNC custom machined in the UK from solid lengths of 6082 aluminium alloy - not cut from tube. Superb quality. Pack of five includes three of 2.5mm and two of 1.0mm. Combination of five covers nearly all fittings whether using a 68mm or 73mm BB. Exact same machined spacer kit as above but now available with new anodized finish. Four colours available - red, gold, blue or black. Note: current blue stock does have some slight blue colour mismatch between the 1.0mm and 2.5mm spacers. CNC custom machined in the UK from solid lengths of 6082 aluminium alloy. Pack of five includes three of 2.5mm and two of 1.0mm. Paypal's basic shopping cart does not calculate international shipping (please see shipping page for full details). If buying from outside the UK please add the extra shipping required via these 'shipping units'. For example, a cog costs £15.95 and UK shipping at £2.50 will be included. For delivery outside the UK shipping is £4.50 (£2.00 extra) so if you purchase a cog from Europe or USA etc you will also need to purchase 1 x £2.00 shipping units.